Knightsbridge School is a modern preparatory school founded in September 2006 located in the heart of central London. We have had the pleasure of visiting Knightsbridge School twice since it opened. In this article, our education consultants recount both their visits. For more information about this school or to determine whether this is the right school for your child, please call one of our education consultants for independent advice today. I spent an engaging hour with the energetic head and founder of the Knightsbridge School, Magoo Giles. He and his team have done an extraordinary job filling the school to capacity after it first opened its doors in 2006. It now has 403 children and Magoo knows the name of every single one, a not inconsiderable task. Children want to talk to him wherever he goes, helping to create the happy, buzzy feel pervading the school. A computer screen near the front door updates parents on events that week, as well as wishing happy birthday or congratulations to the children when relevant. Parents are attracted to the extremely traditional set-up of the school; games trophies fill the cupboards in the reception area, laminated copies of the school code are emblazoned proudly throughout; Latin is taught from age 8, and sport is a priority. The school is a maze of rooms and staircases, with surprisingly airy, if sometimes small, classrooms. Class sizes are no bigger than 16, and all classes have a full time teaching assistant. From Reception until Year 2 children are taught by one teacher in their own classroom. However, when they enter Year 4, they change to subject teachers and move around the school in between lessons. I was impressed how they all knew where to go, aided by one of the countless Gap year students employed each year to help with sports, behaviour, the dining room, and wherever else they are needed. The ratio of 140 staff to 403 children is significant and ensures a high level of support for both full-time teachers and pupils. All children learn French from Reception and in addition they choose between Spanish, Italian, Greek or Mandarin to study (unless they are not yet proficient in English in which case it is only French as an extra). Music is of great importance at Knightsbridge and I thought the six individual music rooms, each filled with a piano and a teacher teaching a wide range of instruments was impressive for a space-challenged London school. There is a large music room, a bright and stimulating Art room (with a full time Art teacher) and an elegant corniced hall complete with climbing frames, and more unusually beautiful cornicing (from the building’s original residential use). Sport is a major part of school life, but like many London schools, Knightsbridge suffers from a complete lack of outdoor space. They rent the cavernous church hall opposite for playtimes, and walk to many of the local parks and green areas nearby, as well as playing in regular matches with other schools both in, and outside London. Pastoral care is considered vital, and the school now has two rooms dedicated to Place2Be, a national charity working in over 235 UK schools to improve the confidence and emotional wellbeing of children. Magoo really has the needs of the children as his ‘raison d’être’. ‘I’m not interested in who you are, I am interested in who your children are,’ he told me, stressing he is looking for interesting and interested children who come from families willing to be involved in school life, to provide the vibrant, community driven atmosphere he has striven to create. Parents are very involved with the school – they have many parent volunteers to help with reading, there is a father’s football team, a mother’s netball team, and Magoo himself coaches football every Saturday morning. This open door policy is not always a given in the independent sector, and it is attitudes like this, and the constant desire to improve, that makes it no surprise that Knightsbridge has filled its classrooms, mostly from word-of-mouth, in only nine years. Our Follow-Up Visit in February 2015. Knightsbridge School offers Pre-Prep and Prep education and begins preparing for their child’s next school move in Year 3/4. Ed does not see the intake of pupils as being either ‘international’ or ‘British’ and they don’t categorise their pupils this way, or record numbers of each; they are a central London intake with a British and International mix; they don’t have quotas to fill. A lot of their students are bilingual but born in London and lived here all their lives – how would you categorise them? Ed thinks one shouldn’t. The school has a fantastic Learning Support Room and is geared to helping EAL children. There is a vertical house system, with four houses and students split between these – so in one house will have students from Year 4 to Year 8 who see each other twice per day. This helps with pastoral care. Knightsbridge School is one of a growing number of independent day schools with a counsellor and dedicated counselling room; staff can refer but mostly children self refer. Supervised prep is an optional after school club every day including Friday. Over 60 extra curricular activities, from fencing to yoga, Glee club to Art extension (invite-only) club. At least 4 clubs run at the school on a Saturday morning with sports included. 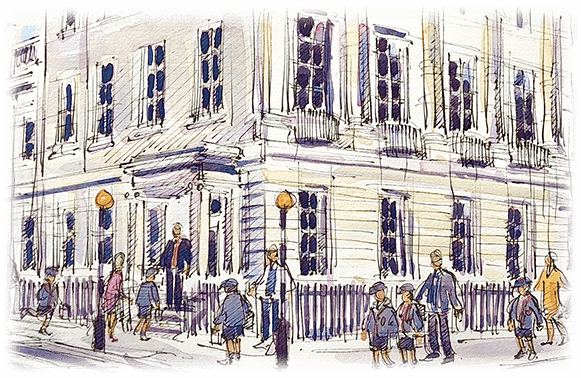 We offer independent advice to ensure you have a full understanding of London’s leading prep schools and the admissions processes for each. To learn more about how we can help you select the right school for your child, please visit our Preparatory School Consultants page.